In Hot Water | Hot Tubs Are Great. This Makes Them Better. Hot tubs are essential components in the constant pursuit of quality après-ski leisure time. The water, the jets, the room for six. You almost can’t go wrong. But you can go very, very right. So below: five noble enhancements to the hot tub experience. 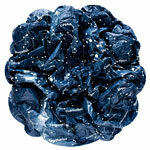 This is: A glow-in-the-dark waterproof constellation map that conveniently crumples into a ball. Because: Constellations are a great conversation starter. And your phone doesn’t do the whole waterproof/crumple-into-a-ball thing well. 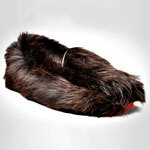 This is: A pair of felt-lined slippers made of lambskin fur and with a slip-resistant rubber sole. Because: Look at them. They’re like the footwear equivalent of warm water and massage jets. 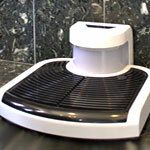 This is: A scale-like apparatus that shoots compressed ionized air upward to dry your entire body in about 30 seconds. Because: Towels just don’t do that. 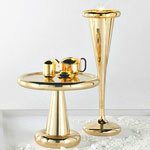 This is: A champagne stand made from solid brass and polished to a mirror finish. Because: You can’t just stash your champagne on the side of the tub. You’re not, like, some kind of champagne-drinking animal. Butlers for Hire. That’s What This Is. 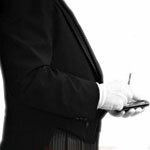 This is: A professional butler service that’ll lend you a personal attendant for just about anything. Because: Drinks, robes and finger foods don’t just fetch themselves. That would be cool, though... But until then: hot tub butler.